actually all around us, ready to fill us with energy, hope, and direction, if we are ready to ingest it? 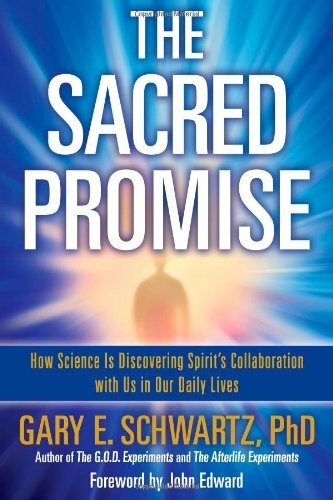 What if Spirit is like air and water, readily available for us to draw within; that is, if we choose to seek it?Sacred Promiseshows how we can attune ourselves and receive this guidance from Spirit, which is all scientifically documented by Dr. Schwartz experiments and research. Prepare to suspend your beliefs about Spirit. create this energy." According to Edward, when he was 15 and "a huge doubter" (in psychic abilities), he was "read" by a New Jersey woman who convinced him that he could become a medium. "She told me things that there is no way she could have known. Edward published his first book, One Last Time, in 1998. His related appearance on Larry King Live later in the year prompted enough phone calls to overload the show's switchboard. The next year, Edward had a show of his own. From 1999 to 2004, Edward was the producer and host of the show Crossing Over with John Edward, which has been syndicated and was broadcast on SCI FI Channel in the United States and on LIVINGtv in the UK. In Crossing Over, Edward gives readings to audience members. Edward's current show, John Edward Cross Country, has been broadcast on We TV, since March 2006. In this forum, the audience is not supposed to supply Edward with any prior information about themselves, their family or whom they are trying to connect with "on the other side." According to Edward, he simply "lets his guides draw him to the people that spirits are trying to connect with, and the audience should only validate the information he gives them". In each episode, after a reading Edward is filmed visiting the person or people whose reading was televised, along with their families, to see how the experience had changed their lives. John Edward has authored several books such as One Last Time: A Psychic Medium Speaks to Those We Have Loved and Lost 1998, Practical Praying: Using the Rosary to Enhance Your Life 2005, and Infinite Quest: Develop Your Psychic Intuition to Take Charge of Your Life 2010. Does Einstein Still Have a Mind, and Can He Prove It? Can Necessity Summon an Inventive Mother? Can Spirit Play a Role in Physical Healing? Are Spirits Illusory and Are We Fooling Ourselves?